Representative-elect Brad Hudson being sworn into the Missouri House of Representatives. It is my honor to present to you this, my first, Capitol Report. The members of the historic 100th General Assembly gathered in the State Capitol Wednesday, January 9, for the opening of the 2019 legislative session. 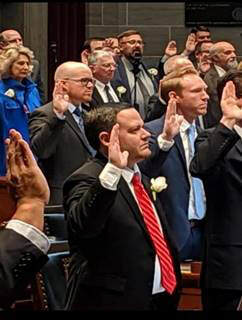 This session the Missouri House of Representatives welcomes 56 first-time members, who took the oath of office alongside 106 returning members. The House now has 115 Republicans and 47 Democrats with one seat currently vacant. In comparison, the Missouri Senate now has a split of 24 Republicans and 10 Democrats. The 2019 session began with Secretary of State Jay Ashcroft presiding over the proceedings. Ashcroft told the new lawmakers gathered in the House Chamber, “Let me encourage you to cultivate the American dream right here in Missouri and leave an even greater opportunity for success to the next generation. With your commitment to enhancing educational opportunities, increasing government transparency, providing critical oversight of the executive and judicial branches, we can continue to make Missouri a land of opportunity and ensure a bright future for our state.” Missouri Supreme Court Justice Mary Rhodes Russell then administered the oath of office to all those in attendance. After House members were officially sworn into office, they elected Rep. Sonya Anderson to serve as the temporary Speaker of the House. With Anderson presiding, members then elected Rep. Elijah Haahr to serve as the Speaker of the House for the 100th General Assembly. They also elected Rep. John Wiemann to serve as House Speaker Pro Tem. Both Haahr and Wiemann then addressed the body to share their goals for the 2019 session. · Passing policies that cultivate employers rather than control businesses. · Building on the historic tax relief passed by the legislature and continuing to balance the budget without raising taxes on Missourians. · Developing 21st century colleges to help create a 21st century workforce. · Continuing to lead the charge to confront the opioid epidemic raging across the state. · Providing opportunities to those in a broken criminal justice system by passing more reforms that build on the reforms made last year to Missouri’s sentencing laws. Haahr reminded his colleagues that they stand for every Missourian. “We stand for the innocent, the infirm, the born and the unborn,” he said. After both the House and Senate wrapped up their typical opening day proceedings, the two legislative bodies convened a joint session in the House Chamber to celebrate the historic 100th General Assembly. 2019 marks two milestone events in Missouri’s history. The First General Assembly of the future State of Missouri convened at the Missouri Hotel in St. Louis on September 19, 1820—nearly a year before the state was officially admitted into the Union. The General Assembly organized, held the inauguration of the governor and lieutenant governor, and elected Missouri’s two United States senators. The first legislature also designated St. Charles as the temporary capital and appointed a commission to report on the site for the permanent capital. Just over 100 years later, on January 8, 1919, the Fiftieth General Assembly convened in the current Capitol for the first full session of the legislature in the new building. The session ended a seven-year period where legislative and executive functions were performed in temporary quarters until the construction of the Capitol was complete. To commemorate these events, the General Assembly held a joint session upon the adjournment of each chamber’s regular session. The joint session was held for the sole purpose of taking a group photograph of the members of the 100th General Assembly. Following the adjournment of the joint session, a special reception in the third-floor rotunda was held to celebrate the milestones. Assisting me in my duties will be Amy Volkart. Amy has 22 years of experience working in State government. She has spent the last 8 years working for the Missouri House of Representatives as a Legislative Assistant. I am confident that both Amy’s experience and work ethic will serve our district well. If you’re ever in Jefferson City please feel free to stop by my office. We are located on the first floor, river side of the Capitol, room 116A-2. Please don’t hesitate to reach out to my office if you feel we may be able to help in any way. Thank you for the privilege of Serving.